Madrid's street art scene changes daily thanks to the contribution of local, national and international graffiti writers. They decorate the streets of Spain's capital with their bombing style, paste-ups or stickers. The number of avant garde events and urban art festivals per year is continuously increasing and we can even observe how the city council's involvement is rising. Cooltourspain is 100% committed to the promotion of the street art in town. Javier became famous in Lavapiés neighborhood after offering daily street art tours in Madrid. His services include unique experiences related to the graffiti movement: walking tours, bike tours and workshops. The street art tours he run will teach you about the history of the stencil art, the techniques used by graffiti writers and insider details of how artists live in this underground movement. La Tabacalera is a former tobacco factory from the XIX century turned into a street art/ graffiti gallery. Madrid is also famous for its nightlife. Electronic music parties have been organized at Mondo club for over a decade. Photography lovers will obtain best pictures from Parque de las Siete Tetas. This park is located in Vallecas neighborhood. 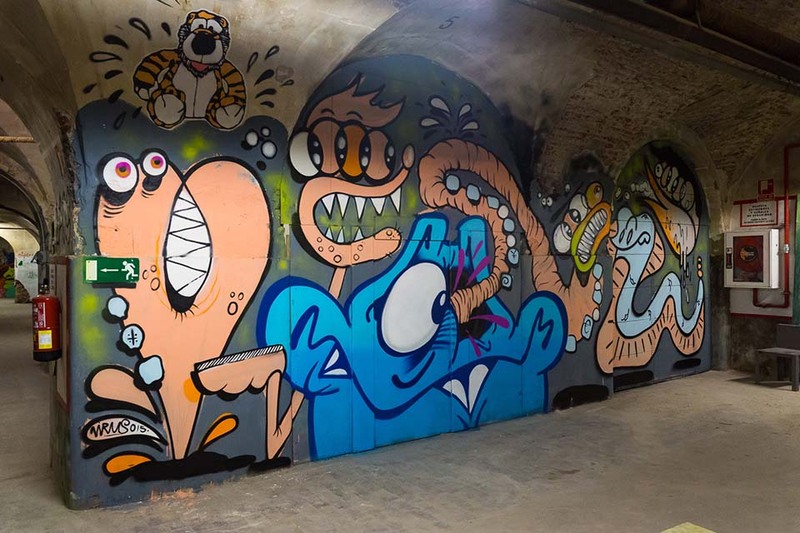 This underground & art brut gallery is located in a former XIX century railway factory. Completely of our recommendation. 'Esto es una Plaza' represents the perfect example of a community hub. Family friendly and street art related.